A rugby club is calling on the skills of a Buddhist monk to help improve their game. Caerphilly Rugby Club have enlisted the help of Gelong Thubten to help the players better their performance on the field. It is hoped that the ancient art of meditation will help the Welsh premiership squad to improve their final scores for the rest of the season. So far this year, the club has lost six of its 10 games, but they hope that they will hit a winning streak after a few sessions with Thubten. Mike Johns, the honorary secretary of the club, who helped arrange the course said it was about "focusing the minds of all those involved". 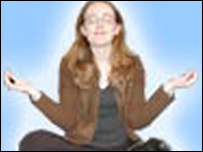 "He can teach their mind to focus it on what is needed on a day-to-day basis. "I have spoken to a couple of players individually just to get a bit of feedback on how they feel. "The ones I have spoken to are taking it with an open mind and are perhaps a little bit excited about what they can learn and what they can take on board." 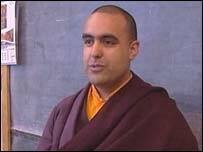 Thubten, who became a monk in 1993, was invited to the club after the management heard about his techniques. "I am going to teach them meditation techniques to allow them to focus and relax," he said. "Meditation is simply learning to train the mind, learning to focus the mind, learning to relax the mind." But he says he has tailored his relaxation techniques to ensure the rugby players are not too relaxed as they are about to kick-off a match. "I am going to be teaching them to be aware of the present moment while they are moving," he said. "I haven't worked with sports people before and I am very excited about it." And how does he think a traditional burly rugby player is going to react to his meditation training? "I have worked with some pretty hostile people before but I am sure that the rugby players are going to be fine." Thubten starts his training sessions with the club next week with relaxation techniques and ways of improving positive thinking.